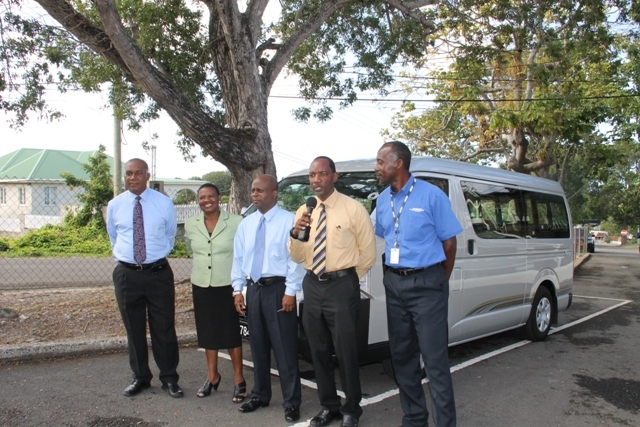 NIA CHARLESTOWN NEVIS (JANUARY 06, 2015) — In its continued efforts to satisfy the needs of the children of Nevis, the Nevis Island Administration (NIA) in collaboration with local vehicle dealers the St. Kitts Nevis Anguilla Trading and Development Co. Ltd. (TDC), invested $135,000 in a new 15-seater Toyota Hiace passenger bus for use by parents and students of the Cecele Browne Integrated School at Prospect. The vehicle was handed over to the Department of Education at a small but significant ceremony at the grounds of the NIA Building at Bath Hotel on January 05, 2015. In brief remarks, Premier of Nevis and Minister of Education Hon. Vance Amory said the administration is pleased to be able to respond to the needs of the parents and the students in keeping with its all-inclusive and all-caring approach to looking after the people of Nevis. He described the handing over as timely and explained that the administration was moved to procure the vehicle following a number of complaints from teachers and parents regarding the inconveniences the special education students suffered with the lack of a vehicle assigned to the school to transport students to and from school and school activities. “We did not want to have any form of discrimination…so we provide them the same type of service to which the students attending the primary school and the high schools receive having them bused to and from school,” he said. Mr. Amory acknowledged that the investment came at a cost to the administration and used the opportunity to impress on those who would use the service to treat it with respect, protect and preserve it to ensure that it lasts. 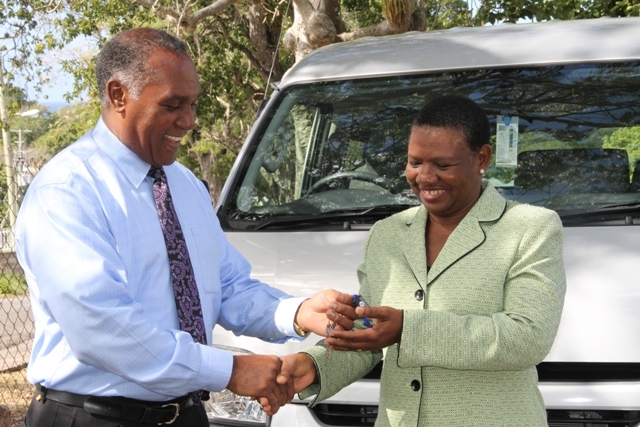 Permanent Secretary in the Ministry of Education Wakely Daniel who received the keys from TDC representative Tony Nisbett said the bus provided for the special education students is evidence that the Department and the Ministry of Education care about the needs of all the children of Nevis. He said once the concerns were presented to Mr. Amory, there was no hesitation to provide the new bus for the school. He then contacted TDC for their assistance and the company willingly helped. Mr. Daniel used the opportunity to thank all who were involved in providing the school with the new bus. Meantime, Principal Education Officer Palsy Wilkin who received the keys from Mr. Amory registered gratitude on behalf of the Cecele Browne Integrated School. 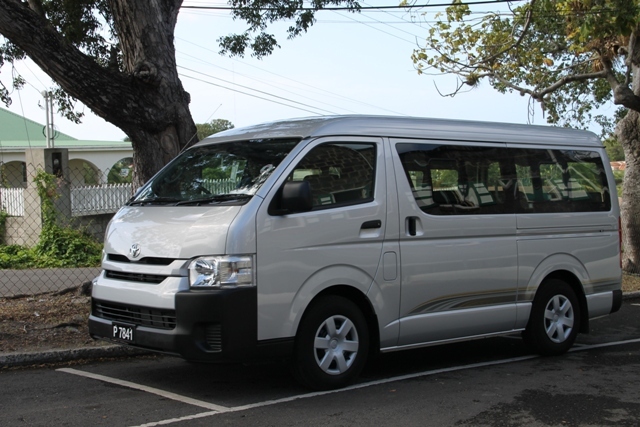 She noted that with the vehicle now assigned to the school, parents would no longer have to use private buses to take the students to the St. Thomas’ Primary School to await the regular school bus to get them to school after they are finished with the high school runs. Wilkin said she is pleased for the new vehicle because it will be able to go the whole route around the island, pick up the students as close to their homes as possible and get them to school and back. “I am really very happy because in dealing with those students you do not just interrupt their schedule. They do not take kindly to interrupting their schedule. They have to be accustomed to a routine and so this bus will really help us to stick to that routine with our students,” she said.